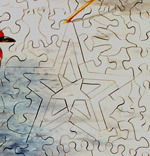 Puzzleplex present hand-cut jigsaws and three-dimensional wooden puzzles designed and created by the Stocken family. The popularity of both the jigsaws and the puzzles is due not just their high quality but that each is made individually. And the Stocken family go out of their way to cater, if possible, for every whim, fancy and variation that their customers want. 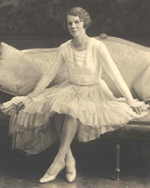 Enid Stocken cut jigsaws from 1915 to 1983, and achieved world-wide renown for her skill and artistry. Her jigsaws went all over the world and are now collectors' items. Jigsaw cutting was taken up by Enid's children and grandchildren who now create highly imaginative hand-cut jigsaws that would have delighted Enid. In 1973 Peter Stocken devised and developed hand-cut three-dimensional wooden puzzles, his own particular form of fiendish puzzle which many now treasure as works of art. The Stocken family has been producing hand-cut jigsaws and puzzles for nearly 100 years. Read a brief family history.